We wandered over to the Mercedes hall, and notice we said hall, not stand, as they have their very own hall just like BMW, and so need to put on a spectacular performance. There’s only one car that really turns heads here: the new SLS AMG Gullwing sportscar. Carefully evoking, if not copying the original Gullwing it remains pretty faithful style-wise, once you’ve overlooked the non-round headlights. The important fact to note is that this is not a show car but a production reality, which arrives for sale in the UK in the summer of 2010. Benz, making the new gullwing the ideal synthesis of the strengths of Mercedes-Benz and AMG. The new super sports car from Mercedes-Benz and AMG dazzles with its unparalleled technology package which includes: an aluminium space frame body with gullwing doors; an AMG 6.3-litre, front-mid V8 engine with a top power of 571 hp, 650 Nm of torque, and dry sump lubrication; seven-speed dual-clutch in a transaxle configuration; a sports chassis with aluminium double-wishbone suspension; and a kerb weight of 1,620 kilograms. It’s a combination that guarantees supreme handling dynamics. The car’s ideal weight distribution between the front and rear axles (47 to 53 per cent respectively) and its low centre of gravity emphasize the concept’s pronounced sports car nature. The gullwing accelerates from 0 to 62 mph in 3.8 seconds and has a top speed of 197 mph (electronically limited). The fuel consumption of 21.4 mpg (combined) is best-in-class (all figures are provisional). “With the new SLS AMG, Mercedes-Benz is presenting a fascinating super sports car that will quicken the pulse of any car fan. The SLS AMG bolsters both the Mercedes-Benz and AMG brands equally, and will surely become one of the most alluring sports cars of our time,” says Dr. Dieter Zetsche, Chairman of the Board of Management of Daimler AG and Head of Mercedes-Benz Cars. “In the SLS AMG, our customers benefit first-hand from the expertise gleaned by Mercedes-AMG from more than 40 years of motorsport experience. The unparalleled technology package provides extraordinary handling dynamics with moderate fuel consumption—another hallmark of AMG today,” says Volker Mornhinweg, Chairman of Mercedes-AMG GmbH. “It is more than just the exclusive gullwing doors that make the design of the new Mercedes-Benz SLS AMG so special. Our aim with this interpretation is to create the classic car of the future and put the most beautiful sports car of the 21st century on the road. Another of our goals is to create a new design icon that, like other Mercedes-Benz models such as the CLS and the SL, will help shape future models of the Mercedes-Benz brand. At the same time, the new SLS is a harbinger of the design philosophy of future Mercedes-Benz sports cars,” says Volker Mornhinweg, head of Mercedes-AMG GmbH. The distinctive design of the new Mercedes-Benz SLS AMG dazzles with its passionate sportiness and reinterprets the breathtaking design of the Mercedes-Benz 300 SL, one of the most recognised design icons of the Mercedes-Benz brand. With its purist design, the new SLS AMG reflects the teachings of modern sports car design: The nearly two-metre long-bonnet, the low, far back positioned cabin, and the short rear with the extendable rear spoiler symbolize dynamism, as do the long wheelbase, the wide track, and the large wheels. The proportions are determined by the short overhangs and the design of the super sports car, with a low-slung, front-mid engine mounted well back and a dual-clutch transmission in a transaxle configuration. 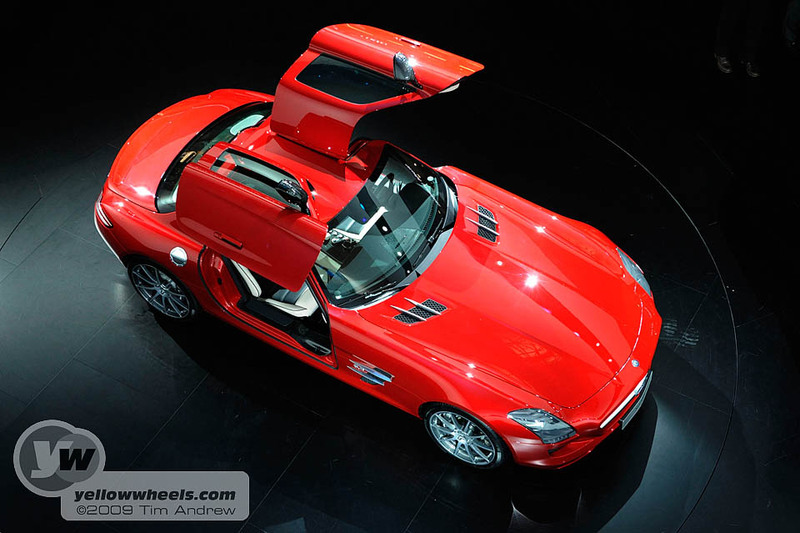 The stylistic highlight is without a doubt the gullwing doors, which impart the SLS AMG with incomparable charisma and make a unique statement in this vehicle segment. It is not just the gullwing doors that awaken reminiscences of the Mercedes-Benz 300 SL. The characteristic wide radiator grille with the large Mercedes-Benz star and the wing-like fin are also reminiscent of the face of the legendary sports car. The three-dimensional, sculptured front with the low, v-shaped front skirt with lateral indentations gives the gullwing a powerful stance on the road. The car’s dominance is underscored by six large air intakes and the wideset, vertical headlamps with intriguing internals: The central bixenon low-beam headlamps with metallic wing element are framed by two LED indicators above and two LED daytime running lights below. Echoes of aircraft design are stirred by the exposed Mercedes-Benz star, whose cone in profile resembles the air intake of a jet engine, and the long bonnet. The further the viewer’s eye wanders to the front, the greater the curvature of the bonnet. The same visual effect is produced by the design of the four “silver shadow” fins gracing the two air vent grilles on the end of the bonnet. These lines, which are typical for aircraft, also optically accelerate the air flowing past, giving the SLS AMG an extremely dynamic appearance even when standing still. The fins on the bonnet are also visible on the vehicle’s flanks. Aficionados will recognize this as another typical styling element of the 300 SL. The “6.3” badge integrated between the fins provides a direct reference to the large displacement, naturally aspirated V8 engine. Extending from the lateral air outlet is a style-defining character line, which together with the convex inclination and the exciting surface treatment combines aesthetics with power. The compact passenger compartment is extremely attractive and unmistakable, and with its high waistline, low side windows and steep windscreen which resembles a visor. The B-pillar, which is inclined to the front and transitions to the rear window with an elegant curve, gives the impression of pure dynamics. The pronounced shoulder of the SLS, which extends from the front to the rear like a taut muscle, is striking when the car is viewed from the side. The wheel arches that extend powerfully from the sidewall are filled by striking 19-inch (front) and 20-inch (rear) light alloy wheels. Three different styles of wheels all provide a view of the large, AMG high-performance composite brakes. When viewed from above, an unbroken line extends along the muscle from the headlamps to the rear. This stylistic feature is also found on the bonnet, where the eye follows a striking contour extending over the roof between the gullwing doors to the third brake light. The rear view of the SLS suggests dynamics and power. The gently sloping boot lid, the pronounced shoulder and the flat tail lights all give the car a wide appearance. The unusual horizontal split lights provide an interesting look thanks to sporting LED technology, in the shape of a wing they impart a fascinating and distinctive night design. The LED fog lamp/backup light is mounted low and in the middle, Formula 1 style. The black diffuser insert and the two chrome tailpipe baffles of the sports exhaust system are also inspired by motor sports. The sharp indentations of the rear skirt allow a clear view of the wide rear tyres and give the gullwing a self-assured road stance. The spoiler integrated into the boot lid extends automatically at a speed of 75 mph and provides outstanding stability at high speeds. The colour pallet for the SLS comprises a total of nine exclusive shades. The highlight has to be the unique “AMG Alubeam silver” paintwork. The new process used nowhere else in the world lets the paint shine like liquid metal. The paint covers the body like a metallic skin, emphasizing the gullwing’s fascinating design lines more strongly than any other paintwork and makes them livelier by means of targeted light reflections. This effect would not be possible without tiny pigments measuring 30 to 50 nanometres. The matte paints “designo magno Allanite Grey” and “AMG magno Sylvanite Grey” are just as attractive. Their silk matte surface emphasizes the sporty character of the two-seater by sharply defining the contours of the edges. Drivers who raise the gullwing doors of the Mercedes-Benz SLS AMG and sit down in the sports seats will experience a very special interior. In its conception, the Mercedes-Benz designers took their cue from aircraft construction to create an ambience that immediately evokes associations with plane cockpits. The defining stylistic element is the dashboard, whose powerfully extended wing-like profile creates the impression of great width. The dashboard incorporates “silver shadow” electroplated air vents with adjustable nozzles, which simulate the look of jet engines. The instrument cluster with its shift-up LED display and two white illuminated circular instruments also appears very sporty in the metallic silver shadow look. The silver dials have red pointers and a 225 mph scale. The main feature between the dashboard’s two centre air vents is the COMAND multi-media system with its 7-inch screen. The elongated centre console made of real matte metal also takes up the plane cockpit theme. Among other things, the centre console incorporates the AMG DRIVE UNIT, which is aligned towards the driver’s seat and enables SLS owners to customize their vehicle set-up. The AMG SPEEDSHIFT DCT 7-speed sports transmission is operated by means of the E-SELECT lever, which is styled like a jet’s thrust regulator. All of the control elements are of real metal, again boasting a shiny “silver shadow” surface. The cockpit impression is rounded off by the concave interior trim of the gullwing doors, the high waistline clearance and the muscular side skirts, which all convey the feeling of sports car ergonomics. The high craftsmanship of the SLS interior is demonstrated by the use of refined materials such as nappa leather, metal detailing, and, as an option, real carbon appliqué. All of these features express a great attention to detail. To help customize the interior, the leather is available in five designo colours: black, classic red, sand, porcelain and light brown. Despite the low seating position typical of sports cars, which means the seats are located only 369 millimetres above the road surface, the wide opening gullwing doors ensure easy entry and exit. The designers made sure that the doors had as large an opening angle as possible, which is why they swing up by 70 degrees. Another consideration that was just as important was that the distance between the opened doors and the road surface is an ample 1.50 metres, while the size of the passage between the opened doors and the upper edge of the side skirts is a generous 1.08 metres. By contrast, the entry height (the distance between the road surface and the upper edge of the side skirts) is a low 45 centimetres. Another important criterion for ensuring an elegant entry and exit is that the opening and closing of the doors requires little effort even when it’s very cold, because of two gas-dampers next to the door hinges. The gullwing doors require less room to open than conventional coupe doors and can be completely opened in standard sized garages. The gullwing doors can be opened from the interior by means of a “silver shadow” opening handle. Thanks to the linkage system in the door’s armrest, the door is easy to handle when closing. The buttons for the power windows, the central locking system and the exterior mirror adjustment are also easily accessible in the interior trim. The interior has a spacious feeling, due primarily to the large shoulder room of 1483 millimetres and the wide elbow width of 1606 millimetres. In conjunction with the generous headroom of 990 millimetres and the driver’s effective legroom of 1058 millimetres, the deep seating position is also relaxing. The passengers benefit from a relatively steep windscreen that provides a good view. The backrests of the sports seats are made of magnesium, a high-tech material that is strong as well as light. This results in substantial benefits with regard to the vehicle’s weight balance and the lowering of its centre of gravity. The sports seats have two-zone seat cushions. Large side bolsters filled with harder foam ensure optimum lateral support, while the inner zones of the seats and backrests have purposefully been made softer for high long-distance driving comfort. The Memory Package enables the user to electrically adjust the seat’s lateral position and height as well as the tilt of the backrest, seat cushion, and steering column. In addition, the package allows the user to save up to three individual settings. Four-way lumbar supports provide effective support for the spine, while adjustable side bolsters in the backrests substantially improve lateral support when driving around bends at high speeds. Other standard features include a three-stage seat heating system as well as seat occupancy and child safety seat detection for the front seat passenger. The sports seats with integrated headrests and sporty transverse piping are covered with designo leather. Two-tone seats are also available in the colours classic red, sand and porcelain. Cars with the interior colour light brown use natural leather with especially high quality braided leather for the centre fields of the seats. Depending on the colour combination selected, the sporty feeling is further enhanced through the use of fluorescent or black piping. The three-spoke performance leather steering wheel with a 365-millimetre rim, gearshift paddles and a metal detailing emphasize the vehicle’s authentic hand-crafted character and provide the best possible assistance in maintaining control of the car. Other impressive features of the SLS AMG interior are conveniently designed stowage areas for ensuring the car’s suitability for everyday use, a hallmark of Mercedes-Benz design. The dashboard on the front passenger’s side contains a 3.7-litre glove compartment and a storage bin for glasses. To the right of the E-SELECT lever, passengers will find a small stowage area with a 12 volt socket or an ashtray with a lighter. The armrest behind the centre console not only serves as the location of the COMAND controller; it can also be shifted in two stages at the push of a button to provide access to a storage bin located underneath. Here, users will find two cup holders and the recess for a telephone (optional equipment). Additional storage space is provided by the stowage system between the seats at the back and the mesh side pocket in the front passenger footwell. Two clothing hooks are fixed to the backrests. Their counterparts in the roof lining can be folded out and have silicone damping. The button for unlocking the rear hatch can be found underneath the light switch. In addition, the hatch can also be opened by using the key. The luggage compartment has a volume of 176 litres. The SLS is also taking a new approach in its body concept. For the first time ever, Mercedes-Benz and AMG are presenting an automobile, where both chassis and body are made of aluminium. This leads to significant weight savings compared to the traditional steel construction, as shown by the car’s kerb weight of just 1,620 kilograms. The vehicle’s all-new body consists of an aluminium space frame, which combines intelligent, lightweight design with the highest strength and thus further boosts the SLS’ excellent handling properties. Light aluminium profiles combine the force nodes to create a stable structure. The large, low-lying cross-sections of these aluminium profiles exhibit high resistance torques, thereby ensuring the desired direct transfer of drive, braking and chassis forces. Undesired flexibility is reduced by the structure; the vehicle responds rigidly, directly and as if it was almost free of torsion. The intelligent aluminium space frame, which has been optimized in terms of weight, is 45 per cent aluminium profiles, 31 per cent aluminium panelling, 20 per cent cast aluminium and four per cent steel. Ultra high-tensile, hot-rolled steel is used in the A-pillars to further improve occupant protection. The body-in-white weight is 241 kilograms — and given that the maximum power is 571 hp, represents a top value in the super sports car segment. The overall vehicle concept has been designed with the lowest possible centre of gravity. That means a low connection between the drive train and the axles, as well as the lowest possible arrangement of the body-in-white components that contribute to rigidity. Examples include the connections between the front and rear sections and the occupant safety cell, which are resistant to bending and torque. These connections have been consistently designed to run along the lowest possible force paths. The result is not only a low centre of gravity but also a harmonious, and thus efficient, transfer of force within the vehicle’s structure. Another hallmark of the lightweight construction is the transverse reinforcing struts that are integrated into the body-in-white structure at the front and rear axles. The profiles connect the side members exactly at the points where the strongest forces act on the body-in-white when the vehicle is taking a fast bend. The advantages of this painstaking solution are a matchless degree of transverse rigidity and the avoidance of heavy secondary stiffeners or consoles. The aluminium space frame forms the basis for providing outstanding passive safety. The comprehensive range of standard equipment includes three-point seatbelts, seat-belt tensioners, belt force limiters, and up to eight airbags: adaptive front airbags, a kneebag each for the driver and front passenger, two seat-integrated sidebags and two windowbags for protection from side collision. The heart of the new SLS is a high-powered eight-cylinder engine manufactured by Mercedes-AMG. The advanced 6.3-litre V-8 engine, which has an output of 571 hp at 6,800 rpm, makes the gullwing vehicle one of the most powerful sports cars in its segment. In conjunction with the low vehicle weight, this results in a weight-power ratio of 2.84 kg/hp. The naturally aspirated engine provides its maximum torque of 650 Nm at 4,750 rpm. The gullwing vehicle accelerates from 0 to 62 mph in 3.8 seconds and has an electronically limited top speed of 197 mph (all figures are preliminary). The high-torque V8 engine, which is called the M159 within the company, has a displacement of 6,208 cc. It has been completely restructured compared to the basic M156 engine, and it displays the typical characteristics of high-performance racing engines. The most important measures taken to boost its performance were the development of a completely new intake manifold system, the restructuring of the valve gear and the camshaft, the use of streamlined steel-pipe fan-type exhaust pipes and a dethrottling of the exhaust system. As a result, the designers have achieved significantly improved cylinder charging that boosts performance by almost nine per cent. The eight-cylinder engine reacts nimbly to movements of the accelerator pedal and in general responds extremely well. Thanks to the change to dry sump lubrication, it has been possible to achieve a much lower installation position for the engine. The consequent lowering of the vehicle’s centre of gravity enables high transverse acceleration, which results in handling dynamics that drivers love. The use of high-strength components compensates for the increased burden on the engine resulting from its higher output. Forged pistons, a strengthened crankshaft mounting, an optimized crankcase structure, and improved lubrication by means of a need-regulated high-powered oil pump ensure maximum stability. In spite of the increased demands placed on it, the engine weight of the M159 has been further reduced. The forged pistons, as oscillating masses, make a particularly valuable contribution to this reduction. This results in a dry weight of 205 kg, and thus a weight-power ratio of 0.36 kg/hp — a value that is unmatched by any competitors. Sophisticated catalytic converter technology makes it possible to comply with current and future emissions limits such as EU5, LEV2 and ULEV. In spite of its uncompromisingly sporty character, the vehicle has reached ambitious fuel consumption targets. 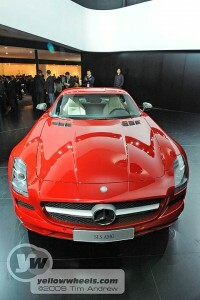 The SLS AMG returns 21.4 mpg (combined; preliminary figure), which makes it the front runner in its competitive field. It boasts efficiency-boosting measures such as the AMG-exclusive, friction-optimised LDS cylinder-bore lining, an oil supply that is regulated according to the characteristic map, and smart generator management. During every coasting phase of the vehicle and every braking action, kinetic energy is used to charge the battery rather than being uselessly transformed into heat, as happens in conventional engines. Conversely, the generator is switched on without a load during acceleration and thus eases the burden on the engine. The AMG 6.3-litre V-8 engine transmits its tremendous power to the rear axle via an especially lightweight drive shaft made of carbon — similar to the DTM C-Class touring car. The dual-clutch transmission is located on the rear axle (in line with the transaxle principle) and is tightly connected with the engine housing by means of a Torque Tube. In the Torque Tube, a carbon camshaft rotates with the same speed as the engine. The advantages of this sophisticated solution include the rigid connection between the engine and the transmission, which results in an optimal response to forces and torques. The new AMG SPEEDSHIFT DCT seven-speed sports transmission is responsible for the power transmission. This dual-clutch transmission is characterized by quick shifting without any interruption of traction — minimum speeds of 100 milliseconds are possible. The driver has a choice of four different driving programmes: C (Controlled Efficiency), S (Sport), S+ (Sport plus) and M (Manual), as well as a RACE START function. During the Sport, Sport plus and Manual driving programmes, the automatic double-declutching function is active; all of these modes can be comfortably managed via the torque regulator in the AMG DRIVE UNIT. Optimal traction is guaranteed by the mechanical differential lock, which is integrated into the compact transmission housing. The solution that was chosen, a front-mid engine plus transaxle configuration, ensures an ideal weight distribution of 47 per cent in the front and 53 per cent in the rear. Mounting the engine behind the front axle provided optimal conditions for perfect handling dynamics with precise steering behaviour, top class agility, low inertia during sudden changes of direction and outstanding traction. The aim of Mercedes-Benz and AMG — to build a desirable super sports car and combine flawless race circuit performance with the long distance comfort typical of Mercedes-Benz — led to this sophisticated chassis layout. All four wheels are guided on dual A-arms with track rod, a technique that has proven itself in motor racing up to Formula 1 level. In a double wishbone suspension, the wheel location and suspension function are separated from each other, and the spring struts/damper struts are supported on the lower transverse link. With its high shatter strength and directional stability, the double wishbone concept decisively controls the wheel, with minimal springy movements, and gives the driver optimal contact with the road surface even in extreme situations. The A-arms, steering knuckles and hub carriers at the front and rear axles are made entirely of forged aluminium — which helps to substantially reduce the unsprung masses; and this in turn improves the responsiveness of the suspension. At 2,680 millimetres, the long wheelbase results in not only a stable straight-line stability, but also a low dynamic wheel load shift which significantly reduces the vehicle’s tendency to roll during acceleration and deceleration. The wide tread — 1,682 millimetres in the front, and 1,653 millimetres in the rear — ensures a lower dynamic wheel load transfer from the inside wheel to the outside wheel on bends, which gives the tyres more grip. When driving around bends, the big castor angle of 11.5 degrees results in a large increase in the negative camber, in addition to improving the tyres’ grip — and lending high stability when braking suddenly in bends. With a constant mechanical gear ratio of 13.6:1, the rack-and-pinion steering gear delivers a consistently direct steering feel, thereby meeting drivers’ high expectations of a super sports car. The parameter power steering works with speed-dependent support and improves feedback for the driver as driving speed increases, a crucial factor when driving straight ahead at high speed. The mounting of the steering gear in front of the engine, on the frametype integral support, allows a particularly low engine position. The gullwing car features a 3-stage ESP®, giving the driver a choice of the three modes “ESP ON”, “ESP SPORT” and “ESP OFF” at the push of a button. Even in “ESP OFF” mode, simply applying the brake pedal makes all ESPÒ functions accessible again. The traction logic of the acceleration skid control ASR is active in all three ESPÒ modes. If a drive wheel begins to lose traction, a targeted activation of the brakes supplies a considerable improvement in traction — especially in combination with the mechanical multiple-disc limited-slip differential lock, which is standard equipment. During particularly dynamic driving, this allows more effective transfer of the engine output to the road. The AMG high-performance composite brakes on the front axle ensure the vehicle quickly comes to a stop even under an enormous load. Even better braking performance is provided by the newly developed, optional ceramic-composite brake system with larger brake discs. Thanks to their increased hardness, the ceramic brake discs offer greater safety at high temperatures and are also impressive by virtue of their weight, which has been reduced by about 40 per cent. Through the reduction of the unsprung masses, they further optimise the gullwing’s handling — which becomes especially apparent during motorway driving and around bends at high speed. Lighweight engineering also played a key role with regard to the wheels: Weight-optimised AMG light alloy wheels in accordance with the new “flow forming” principle will be fitted to the SLS AMG. 9.5 x 19 inches on the front, and 11.0 x 20 inches on the rear, will reduce the unsprung masses and boost handling dynamics and suspension comfort. In addition to the standard AMG light alloy wheels with a seven-spoke design, customers can choose optional wheels with five double-spokes or forged wheels in a ten-spoke design. Tyres developed exclusively for the SLS AMG — 265/35 R 19 in the front, and 295/30 R 20 in the rear, ensure top performance. The standard equipment includes a tyre pressure monitoring system that continuously checks the pressure of all four wheels and displays the individual values for each tyre.